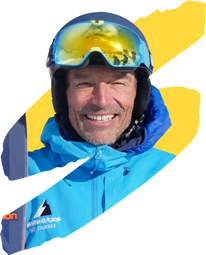 Phil Smith, Snoworks Director, explains why Intermediate skiers should come skiing with Snoworks. Intermediate skiers (level 3) can now benefit from All-Terrain skiing with Snoworks. If you’re an intermediate skier but take one look at our website and think ‘this is too advanced for me’, READ ON. This could change your skiing forever. Why do so many intermediate skiers reach a level and stop improving? This is where conventional ski teaching fails. Conventional ski teaching is based around what we call a CLOSED activity. That is where the environment (in our case the snow) remains CONSTANT. Skiers are taught techniques that they then try to repeat – hands forward, plant your pole, stand up, sink down, face down hill, push into your boots and so on. Skiers then try to repeat these movements and they sort of work ok, PROVIDING THE ENVIRONMENT REMAINS CONSTANT – on Blues and easy Reds. What we describe as our level 3 skier. We’ve created this environment ourselves. Beautifully pisted runs, runs marked with colours, perceptions of great snow and sunny days. Of course as we all know it’s not like this. The cloud comes in, visibility goes, it starts snowing, the run narrows, temperature rises, snow melts, bumps take shape, ice forms, crowds develop and we have it – the classic example of the INTERMEDIATE PLATEAU. It’s where the environment moves from a CONSTANT to a VARIABLE. And of course as the environment moves from a constant to a variable so must your technique or the way you ski. This means a ‘set technique’ no longer works. Welcome to the world of Snoworks and ‘skills’. We’re not interested in how you ski or the way you look. We’re interested in giving you the skills to cope with the mountain so your whole skiing experience becomes so much more enjoyable. We won’t teach you set techniques like facing down hill, pushing into your boots, standing up and sinking down, planting your pole, ‘bending ze knees’ or not sticking your bottom out. These are such basic instructions it’s no wonder so many intermediates hit a PLATEAU. ….and we’re not talking about a few skiers we’re talking about thousands of skiers. Thousands of skiers who no longer improve, stick to Blues and easy Reds, believe they have reached the limit of their potential, continue to be frustrated and scared. Thousands of skiers who just don’t know what their missing. You don’t need to stop improving. You need to simply move away from the standard approach to ski teaching. Move away from the world of CONSTANT techniques to the world of SKILLS. We’ll teach you skills like how to control your speed – as the conditions change, when it gets steeper, when it gets icy, when bumps start to form, when it gets narrow, when visibility goes, when there’s fresh snow on the piste, when it gets slushy etc..
It’s so simple. Standard ski instruction has its roots in CLOSED, CONSTANT ENVIRONMENTS. It’s time to go OPEN with Snoworks. And don’t be put off with the word All-Mountain. This is All-Mountain for you. Reds and Blues that begin to change. Icier, narrower, bumpier, steeper. This is where the journey starts… and think what this will do to your skiing holiday. You won’t have to look out the window in the morning to see if it’s sunny. You can just get into your ski kit and go skiing knowing that you have the skills to get around all the pistes whatever the conditions. Welcome to the world of Snoworks and enjoyable skiing whatever the conditions FOR INTERMEDIATE SKIERS. Your skiing is about to change!